Bathrooms are one of my favorite rooms to decorate. Perhaps it’s because many of them are in classic shades of white. They can be utilitarian and still fabulous. And of course, they should stand up to daily use. Susan and Greg, whose home I featured in this former post, have such a bathroom. Not only is their master bath beautiful and peaceful, it is functional and a true classic. I’d like to thank them for letting me photograph it to share with you all. 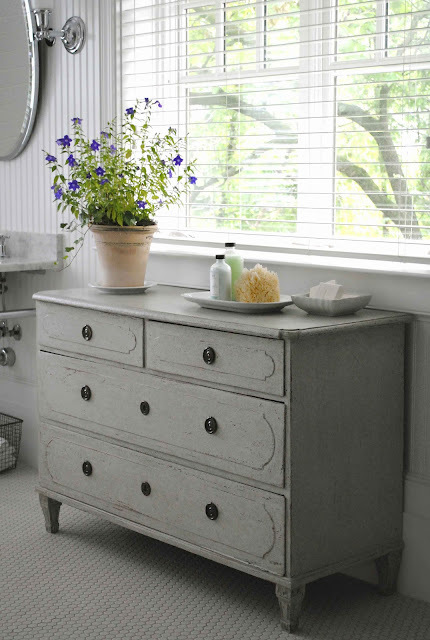 My antique Swedish Gustavian chest found a perfect home in this master bath. The chest provides ample storage while anchoring the pair of open washstands. Mirrors and washstands from Waterworks. The antique chest is an unexpected complement to this utilitarian space. Antique white ironstone dishes also from my shop. Slipcovered Ikea chair and antique wood table soften this expansive space. Carrara marble on shower threshold and the two seats. 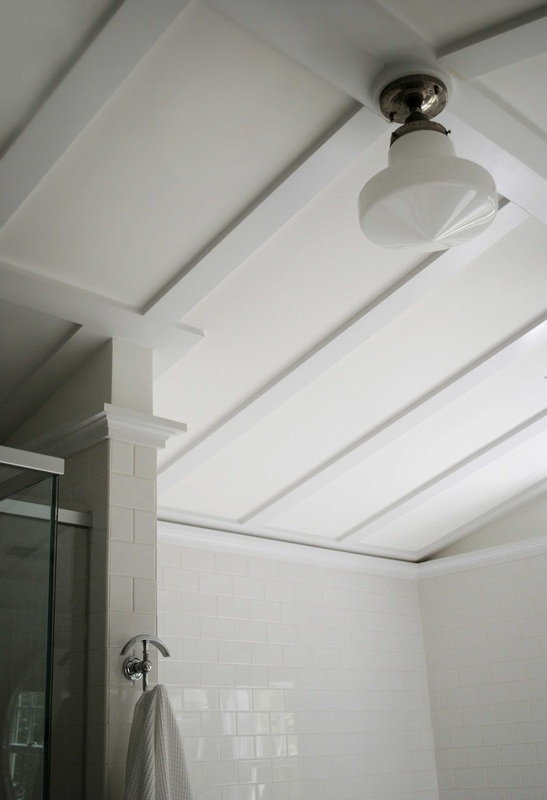 Schoolhouse light fixtures, pitched ceiling and subway tiles. 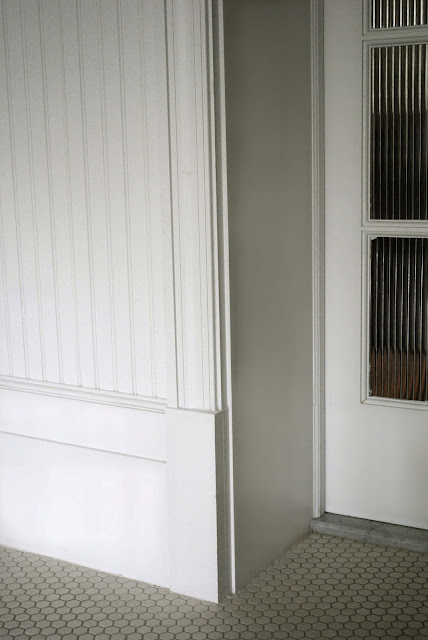 I love the custom tall step-back baseboards. Hexagonal tiles would have been common in homes of this period. Susan found these wire baskets from R. Hardware. The built-in linen / medicine closet has upper reeded glass door and glass knobs. In case you are wondering, the water closet (ahem, toilet :-) is cleverly located behind the shower. A lovely weekend here, sunny and warm (but not humid). Hope you are well. Loi, This is the most beautiful bathroom I have EVER seen. I LOVE ...LOVE IT! Your antique chest with the sinks and mirrors from Waterworks are such a fantastic marriage of elements and textures! It is gorgeous! Love the shower, the built-in linen/medicine closet ....even the flowers! and in it all an Ikea cover for a chair! I'm speechless. There's not one single thing I would change. It's perfect. 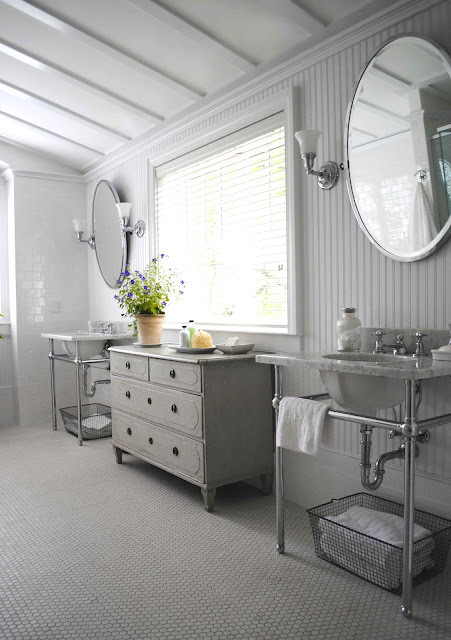 Wonderful classic bathroom and much enhanced by the gorgeous antique Swedish Gustavian chest. Oh dear Loi! I am too old to start all over again, so will have to live with what I have. OMG Loi, I dream of having a bathroom like that. Your chest just enhances its beauty and functionality. I particularly like the round mirrors with side lights over each basin. Genius. Lovely room! I wish my all white bath was so nice. this is beautiful! i love how the tops of the benches have marble, what a thoughtful and posh touch. Loi, don't you just love the term "Water closet?" It sounds so refined! But in this case…it was ! You couldn't even see it, which is the point! This bathroom is the epitome of beautiful! I love tile on the floor! It definitely fits the time period of the home! It reminds me of "Penny Tile" but I'm assuming that Penny Tile is just round? Truthfully, you have left no detail untouched! Which is why I am always in love with your work! Your attention to detail is incredible! This is truly beautiful! What a beautiful and relaxing retreat! 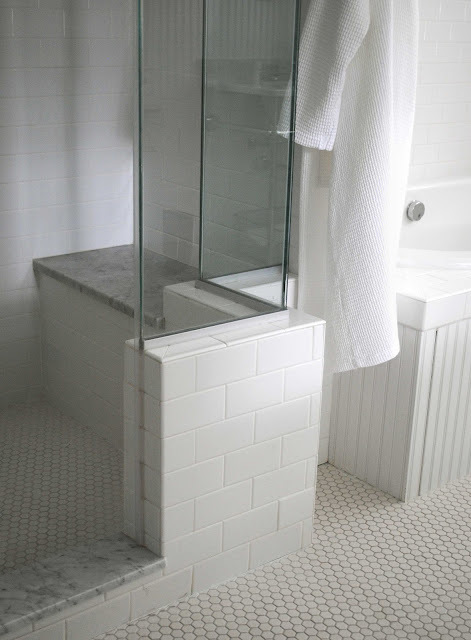 The subtle use of bead board and subway tile is great, I like the play of vertical and horizontal. I really like the distinctive combination of the subway tiles and the schoolhouse light fixtures. What a great way to start each day! I just wish I had a bathroom this big! It is breathtakingly Beautiful! I love the pitch of the ceiling and the ceiling itself! It looks like the flat panels are flat and the trim a high gloss?? Perfect for this space. I absolutely love it! The grey is perfect in there and I love the penny tiles.. I am debating on those for the kids bath here. Loi! It's fabulous in every way!! There is the perfect amount of detail and texture, and I'm in love with that Swedish Gustavian chest... dreamy! A job well done my friend! Best wishes to you!! What a nice space for a master bathroom the amount of light streaming in is a real bonus. All the elements within this space work well and let's face it in a bathroom it is all about tranquillity and time standing still as we make contact with the element of water. Love the calm presence of the details and how the old and new work together seamlessly. I love the sunflower size showerhead. Your clients are very lucky to have you to bring it all together...well done! Loi I love absolutely everything about that bathroom. Especially love the use of your lovely chest. It warms up the space. Something old always adds character ...love it! I always expect perfection here, and you always deliver! I LOVE this bath. 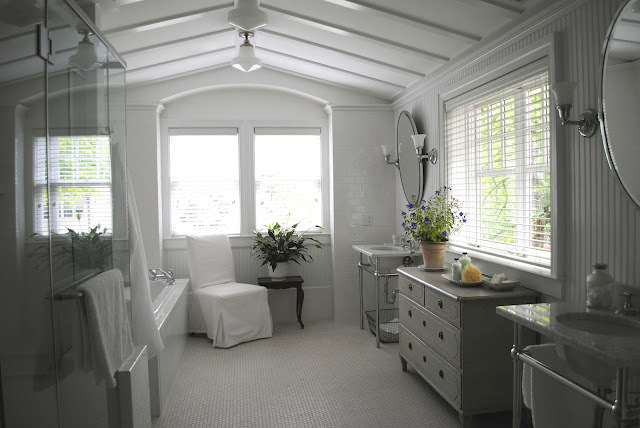 From the beadboard, tile, shower, tub, fixtures, and the chest and other furnishing, this room is the perfect escape. Lovely room...love the contrasting textures...tiles, bead board and marble. Perfectly elegant bathroom! Classic and timeless. This is a bathroom that will stand the test of time! As this was a remodel, I am assuming that the toilet area does not have a door (I didn't see one)? This is so beautiful, Loi and what a huge space it is. I love all the architectural elements and details and finishes! Hope you have a good week ahead! Miss talking! Thank you for featuring this wonderful bathroom. It is such a fantastic example of the art of adding texture and layers with trim and pattern. 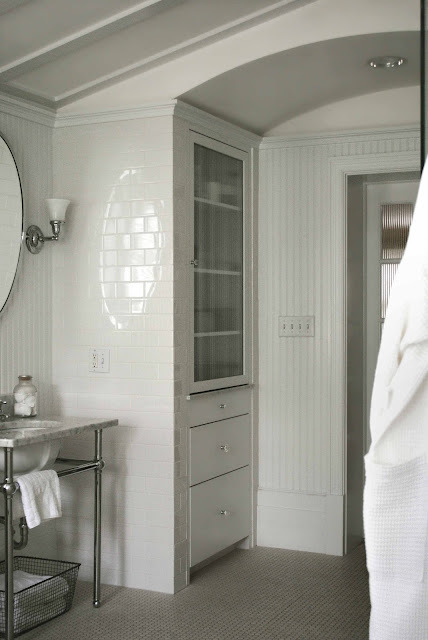 perfection at every turn...I am in love with this crisp and elegant bath...love it all! Hi Loi - This is perfection! I hope you have a wonderful week! Beautiful bathroom! Loving the antique chest, and the use of furniture you wouldn't normally expect in a bathroom. Thanks for sharing this! Love that marble, the tiles (I have them in one of our bathrooms!) and antique chest- stunning. I've got to get over to Ikea.. that slip cover chair looks perfect there! Thank you (and your clients) for the tour. This is beautful. So peaceful ( funny to say that about a bathroom, but.. it is ! ) The use of that chest between the sinks is the perfect compliment. It's interesting to see how this room full of crisp/stark colors still manages to feel SO inviting. I am a huge fan of marble, and this bathroom is beautifully executed. Well done, as usual Loi. 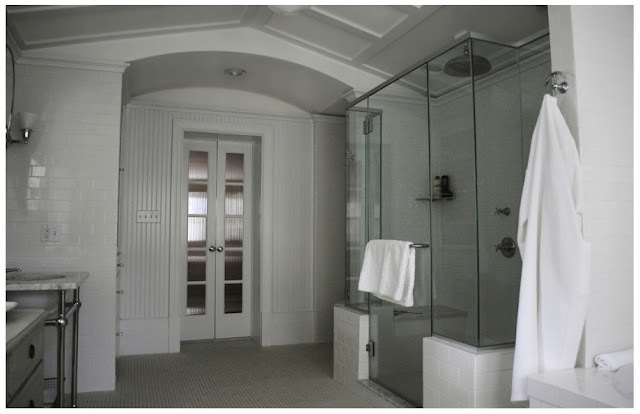 What a gorgeous bathroom...love the addition of the chest to the open pedestals and the all white is fabulous!! What a serene space to start and end your day. I love the Swedish chest for storage under the window! We are using Waterworks fixtures for our new house. They really are works of art. 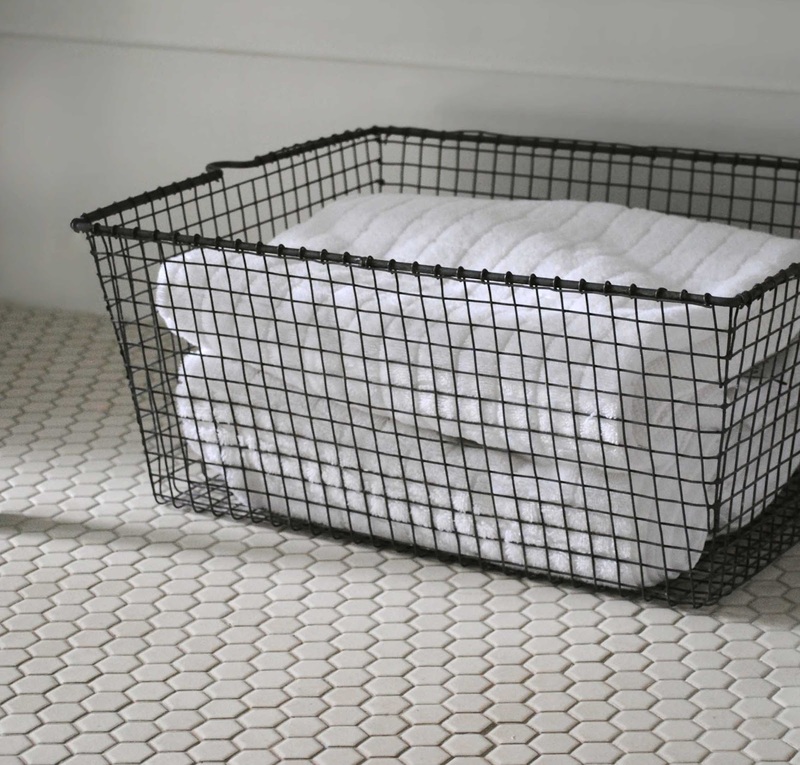 I am in love with the elegant, simple design of this bath. It is calm ans serene. And the Swedish chest looks so beautiful! Thanks to you and your client for sharing such a beautiful space. Have a wonderful week, stay cool! In one word : FABULOUS !!!! I love your Swedish chest in the bathroom. The mix of antiques and a little industrial feel is one of my favorite looks. Its a perfect place for it. It gives extra storage and gives some softness to the room. I'm in love with this bathroom! Thanks for posting! So restful and beautiful! Love the mix of tiles in shades of white, the graceful arch and the metal playing of that gorgeous antique. What a gorgeous bathroom! We're getting ready soon to renovate our master bath and the sinks are exactly what we plan on putting in our bath to make things seem more open. It's a long and somewhat narrow bathroom so this gives me some ideas! I can say, that this interior design is made for excellence. Love all the design choices made for this beautiful bathroom! A great layout too. The antique chest and pretty plant make a wonderful focal point that soften the other surfaces. Another example of Loi's eye for timeless elegance! Really love this bathroom. And it has so much storage, and a chair, and your beautiful chest of drawers. Some people have it all and so do some bathrooms. Not only is this bathroom absolutely fabulous, but it is also the perfect shape, size and layout for the master bathroom extension that I am planning at Hill House! I'll have an exact replica thanks - right down to the colour scheme! You are - as usual - a complete master when it comes to combining functionality with classical looks and pure beauty. If your interiors were a person - they'd be Grace Kelly - classy, elegant and Oh so beautiful. Stunning....and yet calming. This is the perfect master bath oasis. And, that chest! It would be beautiful anywhere, but it seems made for this space! Hope your week is off to a breezy start! The chest is a perfect fit giving the space some age and added interested to the wonderful freshness of the space. Lovely bathroom and great job!!!!! Wow Loi what a beautiful bathroom, and your special pieces add elegance and timelessness to this gorgeous room! I love it when spaces are elegant yet understated, I think it makes them stand the test of time and never go out of style. Simply divine! Every detail has been thought through perfectly. And I love the pitched ceiling, simple white hex tiles and the softness your painted chest brings! Beautiful! The details are perfect. Soothing and beautiful! Exceptional attention to detail!! Absolutely stunning! You did a wonderful job! I love the antique dresser, it adds a touch of history and timelessness to a new shiny space. 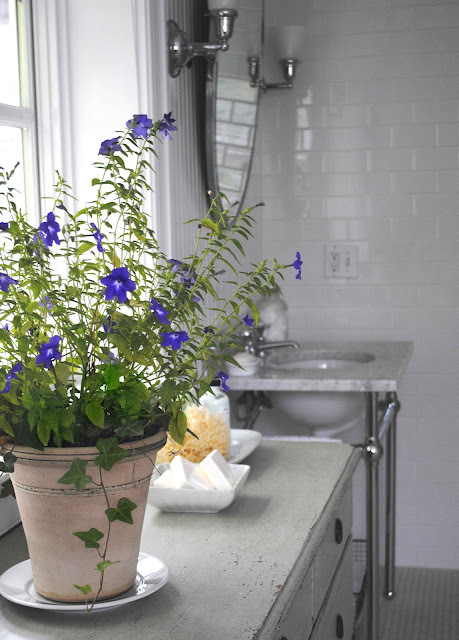 I love how textural this bathroom is with the beadboard, the hex tile and the gorgeous finish on the subway tile. I am tempted to pet all these surfaces! I do love that shower, we had a walk-in glass shower like that for several years and now have a little standard bath with curtain here in Japan. I don't miss wiping down the glass but I do miss the elbowroom for sure! The design of this one is much smarter than most with places to sit and stash stuff. Another great job! Loi, I love every detail of this bath...Fabulous. And that's the point, every DETAIL has been carefully thought out. This bathroom is absolutely perfect in every way! So beautiful and serene. Thank you for sharing more loveliness, Loi! Thanks for your lovely blog! This bathroom makes me want to remodel mine ASAP. stunning loi, in it's classicism, touch of old world charm, serene color scheme and chosen materials. love the use of furniture in baths and kitchens, your chest is divine. I just discovered your beautiful blog through the dear Elizabeth at Pine Cone and Acorns! Such calm and gorgeous spaces! Dang it there buster...that is one pretty bathroom. Love that you used a chair from Ikea.....boom! Beautiful! A true Classic which will never date. I agree with 'A Perfect Gray' - your chest makes the room!! Also love that the ahem, w.c. is out of sight - wish I had a bathroom big enough so I could do that, although I must admit if I had one of those antique high level cistern ones, I wouldn't mind so much!!! Very good to meet you, Loi! How kind of you to visit me, thank you! Just gorgeous Loi. Your style just speaks to so many. Clean and comfortable. Really beautiful. It is such a private space. So well designed. Simple. Chic yet all those details make it special. Now that's what I call a classic bathroom! Wow! Its so beautiful and timeless. I really like these bathroom designs.Thanks for sharing this interesting blog.